The Union is a new band formed by guitarist Luke Morley and ex Winterville vocalist/guitarist Peter Shoulder. 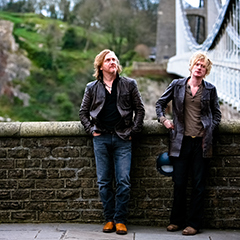 Morley's previous band Thunder disbanded in July this year after their most successful UK tour in their twenty-year history culminated in an emotional sold out show at Hammersmith Apollo. Peter Shoulder is one of only three British artists (the other two being Eric Clapton and Peter Green) to win a W.C. Handy Blues Foundation award, presented in Memphis in 2006 for co-writing the American Blues Song of the year 2006 Luke; 'I met Pete eight years ago and I knew instantly that he had an unbelievable voice that could really move people. He's also a very impressive guitar player. We've worked together ever since whenever our previous commitments allowed us time.' Pete; 'Working with Luke has always been a pleasure. Whenever we get together it is always a very creative, free and inspiring experience. It's an exciting thing to be working on something new with someone who has already had such an illustrious career to date. It all feels very natural.' "The Union" shows a band at the height of their powers. From the balls out, statement of intent of album opener "Watch the River Flow" through to the beautiful acoustic leanings of "Saviour", from the driving riffs of "You Know My Name" to the gentle blues of "Black Monday", from the country rock leanings of "Amazon" to the euphoric album closer "The Space Between Us", The Union produce a very modern take on classic styles. Merging modern and classic rock, blues and country, the bands impeccable songwriting is pulled together by the uniquely powerful and emotive vocals of Peter Shoulder. The album was self produced.